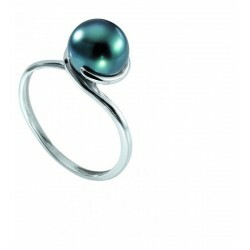 Rosana Sterling silver ring with a Tahitian cultured pearl. A pure and streamlined ring designed to bring out the pearl's color and nuance.Round Tahitian cultured pearl, 8-9 mm AA+ qualityAll our jewelry comes in an individual jewelry box along with a GIA authenticity certificate. Amy Tahitian cultured pearl Sterling silver and zircon ring.A remarkable silver ring with zircons encrusted in chevron shapes on the body, adorned with a Tahitian black pearl on top.Round Tahitian cultured pearl, 9-9.5mm AA+ qualityAll our jewelry comes in an individual jewelry box along with a GIA authenticity certificate. 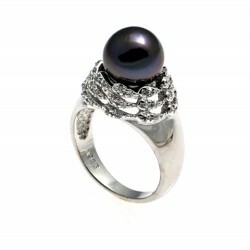 Jola Sterling silver and zircon crystal ring with a Tahitian pearl. A silver ring featuring three spires encrusted with zircon crystals surrounding the Tahitian pearl.An unsual, and beautiful ring.Round Tahitian cultured pearl, 10mm AA+/AAA qualityAll our jewelry comes in an individual jewelry box along with a GIA authenticity certificate. 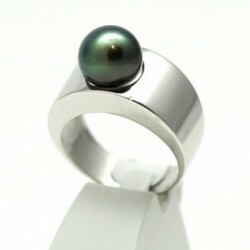 Tehei Sterling silver and Tahitian pearl ring. 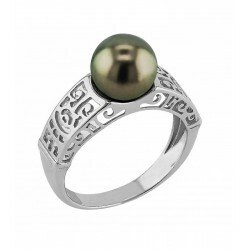 A ring body engraved with polynesian motifs, adorned with a Tahitian pearl at the summit.A piece of jewelry allying sober elegance with polynesian culture. Round Tahitian pearl, 9-9.5mm of AA+ quality All of our jewelry comes in an individual jewelry box along with a GIA authenticity certificate. 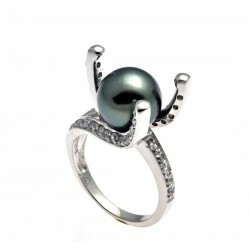 Tiaré Tahitian cultured pearl Sterling silver and zircon ring. One of our favorite pieces of jewelry, whose name comes from the Tiaré flower native to Tahiti. 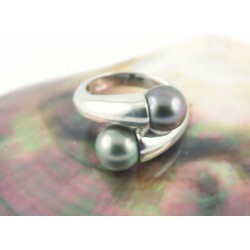 Round Tahitian cultured pearl, 9.5-10mm AAA qualityAll our jewelry comes in an individual jewelry box along with a GIA authenticity certificate. 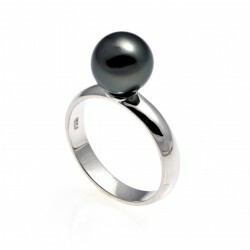 Reva Sterling silver ring with a Tahitian pearl. An intricate, almost organic looking ring with a single Tahitian cultured pearl.Round Tahitian cultured pearl, 9.5-10mm AA+/AAA qualitySilver weight : 2.79g All our jewelry comes in an individual jewelry box along with a GIA authenticity certificate. 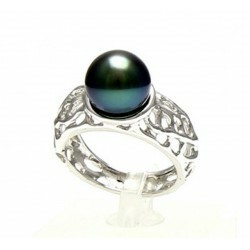 Prestige Sterling silver ring with a Tahitian pearl. 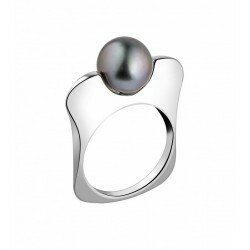 Borrowing the design of a signet ring, this thick ring puts the Tahitian pearl forward.Round Tahitian cultured pearl, 9.5-10mm AA+/AAA qualitySilver weight : 2.79g All our jewelry comes in an individual jewelry box along with a GIA authenticity certificate. 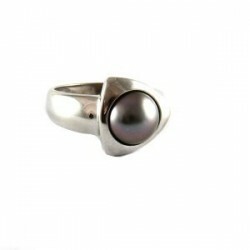 Torsade Sterling silver ring with a half Tahitian cultured pearl. "Torsade" in French means "a twist" Our unique half Tahitian pearls on a spiral ring mount.Half Tahitian cultured pearl, 9-10mm AA+ qualitySilver weight : 3.65g All our jewelry comes in an individual jewelry box along with a GIA authenticity certificate. 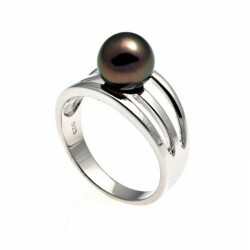 Triangle Sterling silver ring with a half Tahitian cultured pearl. Our unique half Tahitian pearls on a triangular ring mount.Half Tahitian cultured pearl, 9-10mm AA+ qualitySilver weight : 4.20g All our jewelry comes in an individual jewelry box along with a GIA authenticity certificate. 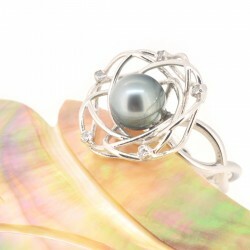 Star Sterling silver and zircon crystal ring with a Tahitian cultured pearl. A star shaped ring encrusted with zircon crystals on the star's rays, and a Tahitian pearl at the center.Round Tahitian cultured pearl, 9.5-10mm AA+/AAA qualitySilver weight : 5.2gAll our jewelry comes in an individual jewelry box along with a GIA authenticity certificate. 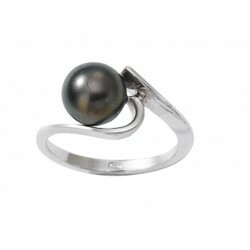 Hoani silver and zircon ring with a Tahitian pearl. 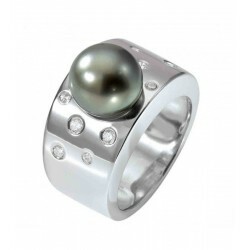 A solid ring body encrusted with zirconium crystals and adorned with a Tahitian pearl at the summit.A luminous piece of jewelry makingyour hand stand out. Round Tahitian pearl, 9-9.5mm of AA+ quality All of our jewelry comes in an individual jewelry box along with a GIA authenticity certificate. 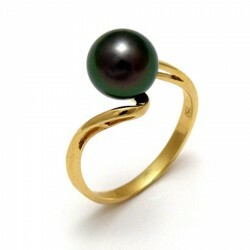 Ocean 18 carats gold ring with a Tahitian cultured pearl. Round Tahitian cultured pearl, 9mm AAA qualityGold weight : 1.85gAll our jewelry comes in an individual jewelry box along with a GIA authenticity certificate. 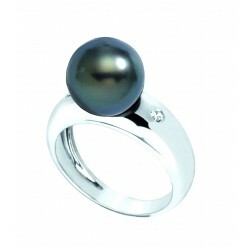 18 carats white gold wedding ring with a Tahitian cultured pearl. Round Tahitian cultured pearl, 9mm AAA qualityGold weight : 1.45gAll our jewelry comes in an individual jewelry box along with a GIA authenticity certificate. 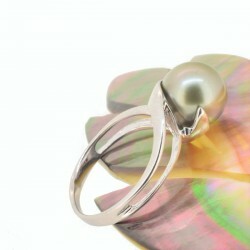 Dany Tahitian cultured pearl 18 carat white gold ring. A simple and elegant 18 carats white gold ring.Round Tahitian cultured pearl, 8.5mm AAA qualityGold weight : 2.59gAll our jewelry comes in an individual jewelry box along with a GIA authenticity certificate.